I wrote recently about The Top 10 Problems TA Leaders Tell Me About. 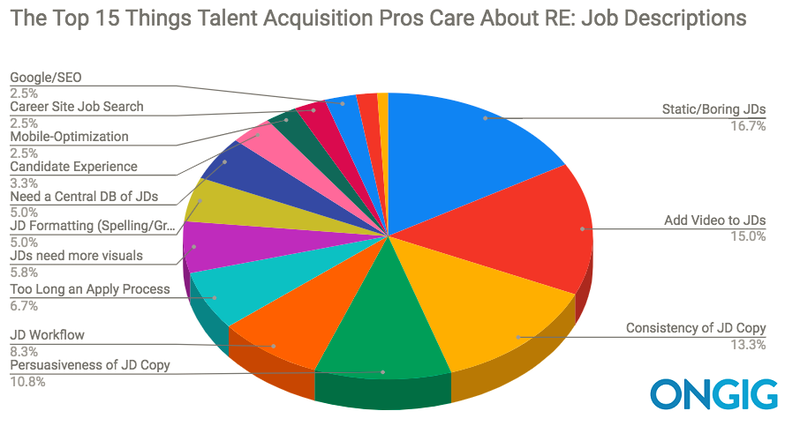 Job Descriptions was the #1 category. This week I’m sharing the specific problems within job descriptions that TA leaders reach out to me about. Prettier, more effective and faster job descriptions — that makes sense! Why I wrote this article — The Ongig team and I are passionate about job descriptions and try to share any data we’ve got that perhaps you don’t. We are actively working to solve problems related to all of these JD topics. If you’d like to see any other data about job descriptions or related topics, please comment below. Thanks for reading!